The mouse-overs & selections actually look good now :) Fixed up some of the graphical problems. Now has 3 styles, dark red, light red, and gray for mouseovers. Thanks to JeremyG and Jarget for their comments and help! If you don't want to lose you bar customizations, send me an email and I'll give you instructions for upgrading. Enjoy! Removed the right click desktop menu special bar since it wasn't supposed to be there in the first place! It got included by accident. People who had problems with this bar due to the 'missing bar' should now be OK. I've been looking for a cool change to my desktop and this gave me functional, clean and cool all in one! Good Job and thank you! it has a couple of problems on my work machine, but i suspect they are machine specific though. i now have two monitors, with the main monitor on the right. when the vertical bar auto-hides it slides across onto the left monitor. quite fun really. however, the auto hiding is very slow on this machine (slow machine). i really do like the grouping of the project files though, very simple and intuative. i dont quite see how you would intigrate tab launchpad into the bar without loosing its small footprint though. hiding its shortcuts under pop out menus somehow seems to defeat the whole point of using tab launchpad to me. i tried it once, but didnt like the result. on a different front, what mp3 player is that? it looks attractive. WindowBlind support is my only suggestion. This skin is a JEWEL. Really a MUST have! This skin is awsome.Its on my desktop with blue_trajectory by charmed and it's killer! Great original skin. 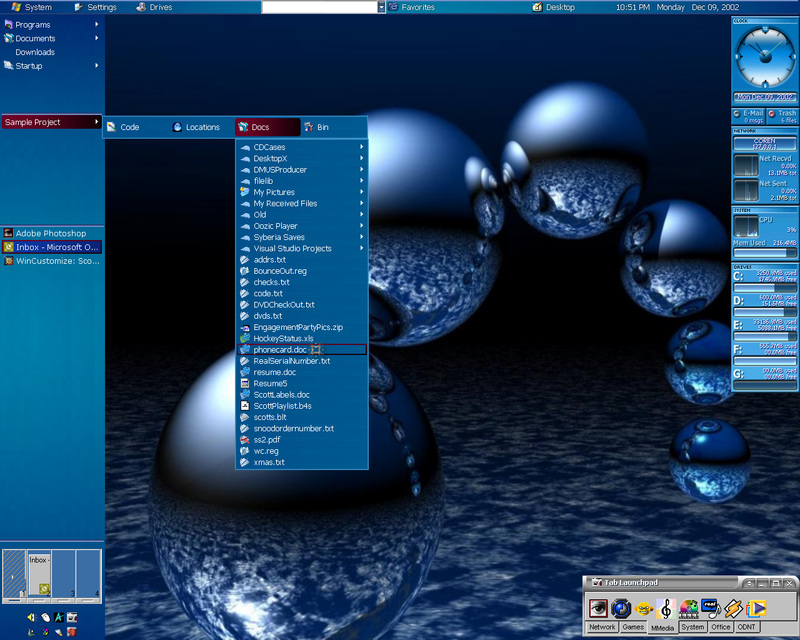 webblinds/windowblinds or a winstyles suite could only be better! Thanks for the comments Looking into doing a window blinds skin to go along with this, I currently use Omega (blue). However it will probably have to wait until after I get married (yeah I know, my priorities are all screwed up....) in Oct. This is the best one ive come a cross. It rocks!! Just wanted to say that this skin rules!!! Best functionally useable OB theme I've used. It's nice to have the things I use right where I want them. Thanks. Where did you get the background? If you really want it, shoot me an email and i'll mail it to you. Nice, professional looking and cool. Very well done. Never posted a comment before. Never had a reason to untill now. This is the best that I have ever seen. If your using developer you know what my ui looks like. I'll be totally honest. It looks very cool and professional, and it's blue, I dig blue and it's very fucntional. Only thing is I hate the mousover on the menus. I'll change the mouseovers on my box. Other than that, it's a keeper Scott. May The Riffs Be With You. ok first time here how do i install this skin. i hate being the newbie. Everyone has to start somewhere If you have Object Bar installed, after downloading the file, you should be able to install and use it by double clicking on the file. Let me know if you have any problems. Cool, Where can I find the wall? Sorry had to give it a poor rating. That selection graphic is pretty bad.